El Gran Combo de Puerto Rico, commonly known as El Gran Combo is a Puerto Rican salsa music orchestra based in San Juan, Puerto Rico. This group received the moniker La Universidad de la Salsa (the University of Salsa) in Colombia due to the sheer number of famous salsa musicians and singers who developed their careers with it. This orchestra was founded in 1962 by Rafael Ithier. He is still nominally, it’s musical director, and is the only remaining member from the band original lineup. They are still actively performing after 56 years. On December 2014, one of its lead singers, Charlie Aponte, retired for personal reasons and on January 2015 Anthony Garcia became a singer as Aponte's replacement. The other two lead singers are Jerry Rivas (since 1977), and Luis Rosario (since 1980). 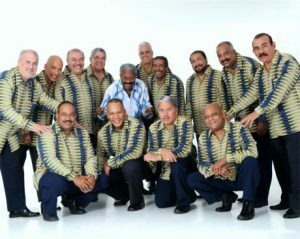 El Gran Combo has recorded about fifty (50) albums and have received many awards.